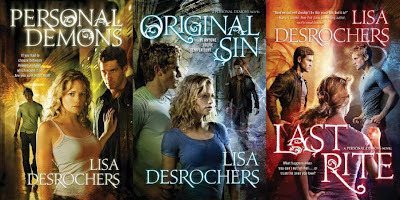 Lisa D. Writes: Win a NOOK Loaded With the Personal Demons Trilogy! 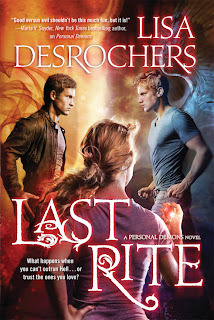 Win a NOOK Loaded With the Personal Demons Trilogy! In this final installment of the thrilling, edgy Personal Demons series, the battle between Heaven and Hell has become critical, and Frannie Cavanaugh is right at the center of it. With the help of the powerful angel Gabe and demon-turned-mortal Luc, Frannie has been able to stay one step ahead of the forces of Hell. But when the demons killed Frannie's best friend and destroyed her brother, they raised the stakes. If Frannie wants to keep her family and friends safe, she knows she has no choice but to go on the run. Their best defense is the power Frannie has been struggling to master, but her attempts to hone her skill go horribly awry. If Frannie doesn't learn fast, the consequences could be devastating—even apocalyptic. What happens when you can't outrun Hell...or trust the ones you love? Luc is a demon’s demon. He's worked in Hell's Acquisitions department for five millennia using every tool at his disposal to tempt teenagers down the fiery path. Frannie's just one more soul. Nothing special. But, from nearly the moment they meet, she makes him feel things. Things demons aren’t supposed to be able to feel. Things he can’t even begin to understand or articulate. But things that make him question everything that he is, nonetheless. He knows Frannie doesn't deserve the fate that King Lucifer has planned for her and, for the first time he finds himself questioning his purpose. And when all of Hell comes after her, he has a choice to make. Gabe has one goal: to keep Luc from getting what he came for. It's his only purpose, and he's willing to do whatever it takes. Because Frannie possesses a unique skill set that has King Lucifer tingling with anticipation, and, if Lucifer gets his hands on her, it would mean the end of Heaven—and therefore Earth—as we know it. But if he goes too far—far enough to lose his wings—he can’t protect Frannie, and he’s useless to her. So, the question is, how far is too far? Because, somewhere along the way he feels things change. What was just a job turns personal. He finds himself being drawn in—wanting Frannie in ways he shouldn’t. And, when it becomes clear that she wants him too, he has to decide if he’s willing to risk his wings—and maybe Frannie’s soul—for what he wants. Frannie finds herself in a place she never imagined, caught in an epic struggle for her soul between Heaven and Hell. And the stakes are high--the fate of Heaven, and therefore Earth hangs in the balance. With Luc and Gabe at her side, she hopes to stay one step ahead of Hell. But what happens when Hell has a face and it's someone you love? Frannie has to decide who she can trust when no one seems to be telling the truth. And her choice might determine the fate of everything. And now your chance to win a NOOK loaded with the Personal Demons trilogy!! Every single person who enters will win Personal Demons swag! Three lucky winners will receive a full set of Personal Demons books, either on CD audiobook (can I just add here that the guy who voices Luc is droolworthy, and the guy who does Gabe... *swoon*), or in paperback. And the GRAND PRIZE WINNER will receive a NOOK LOADED WITH THE ENTIRE TRILOGY!!! All you have to do enter is fill out the form below. The contest is open until LAST RITE release day, Tuesday, May 8th at noon PST! As always, this contest is international. One entry per person, please! This is AWESOME! Talk about a mega giveaway :) thanks so much!! Thank you sooooo much! I would love to win any of the prizes! I <3 this series! I have all 3 books getting ready to start Last Rite! Thank you so much for such a generous giveaway :)! thank you for this AMAZING GIVEWAY! i wanna thank you personally for all of them and thank you for this amazing trilogy, i cant wait till Last Rite is out :D good luck to everyone! Very awesome! Thanks for doing this! I really want a Nook! I hope I win the nook!!!!!!!!!!! !